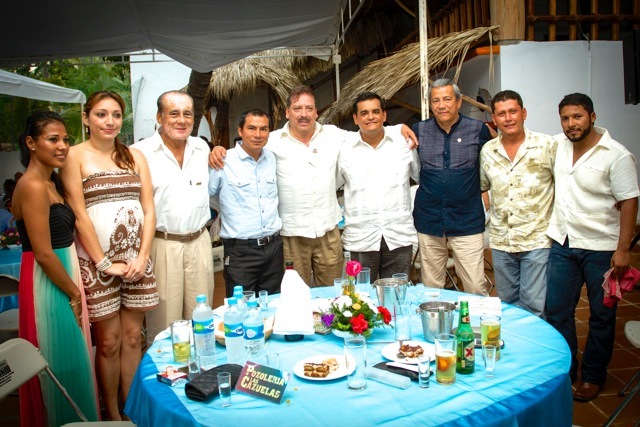 In anticipation of the tourism boom expected in 2015 with the opening of the new highway to Oaxaca, Puerto’s restaurant owners’ association became a chapter of the National Chamber of Restaurants (CANIRAC). at a swearing in ceremony at the Hotel Olas Altas on December 4. There are over 200 restaurants in Puerto Escondido, but at present there are no programs for training waiters and other food workers. The organization seeks to remedy this by creating a training center for restaurant workers and an employment bureau for trained staff. Other goals, according to association president Melesio Armenta Hernández of Mangos, include contracting with suppliers to get group discounts and sponsoring various gastronomic events. The group will represent restaurants on the Committee for Clean Beaches with the goal of getting one or two of our beaches certified. It also plans to be a member of the organizing committee of the Fiestas of November. Joining Melesio Armenta on the executive board are vice president Manolo Mogollón of Playa Kabbalah, affiliate vice president Pablo Carrasco of La Palapa de Carrasco, secretary Helmut von der Rosen of El Nene, and treasurer Francesca Nelida Barrete Simón of La Pérgola Mexicana.